I think also of Charlie Hailey’s acronym-studded, encyclopedic guide, Camps: A Guide to 21st-Century Space (MIT Press, 2009). Hailey’s book charts the multiple dimensions of the camp, “whether as a place of trauma, strategy, or incomplete liberation. . . . organized into three categories of response: autonomy, control, and necessity.” While camps share with homes the poetics of spatial production, camps mark spaces both open and closed, neither temporary nor permanent. Artists Rene Gabri and Ayreen Anastas set out to answer the question, “How is it that a camp like Guantanamo Bay can exist in our time?” Their project embraces the dual “campaign” format: “camp as object of protest and camping as artistic practice and field research.” Gabri and Anastas waged Camp Campaign from their “mobile studio/billboard/library” van, traveling, conducting interviews, and investigating diverse sites ranging from detention camps to summer camps. 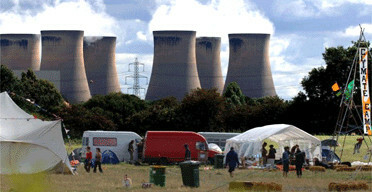 The image at the top of this post depicts Camp Climate in front of Yorkshire, England’s Drax power plant. Is this a good architectural image for ecopoetics? “Protest camps,” writes Hailey, citing examples as diverse in scale as Cindy Sheehan’s 2005 Camp Casey outside G.W. Bush’s Texas ranch or the massive “Asamblea Permanente,” the 2006 occupation of Mexico City’s Zócalo by supporters of presidential candidate Andrés Manuel López Obrador, “are often event-specific . . . reactions to long-standing policies or ideologies. . . . As a communal space of autonomy, the protest camp provides visibility to a group’s message and at the same time affords a cohesiveness that partially insulates its members from public exposure.” Camp Climate follows on the legacy of the Greenham Commons womens’ Peace Camp, that ran from 1981 until 2000, or Faslane Peace Camp, continuously occupied since June 12, 1982. These camp actions have benefited from the UK tradition of the “commons” and its system of regional councils and land-access rights. Cruz’s projects seem to suggest that the NAFTA “free trade zones” might be exploited to similar effect. What systems and traditions, here in North America, might permit more extended acts of protest camping? What might it mean to approach ecopoetics as a making of “transitional architectural systems” rather than of foundational dwellings? For all the charged ethics built into a poetics of “humane solutions,” or of “extreme architecture,” ecopoetics is bound to face the uprootedness, restless nomadism and displacement, if not a sense of utter homelessness, that are a part of its Enlightenment Darwinian heritage as well as of the contemporary political, social and economic moment. The poem as camped out, with “no destination or home,” attuned to a global rather than a homeland front. It may be that the camp is a better architectural and spatial analogy (than the house) for the poem, any poem. But there also may be a poetics specifically oriented to nomadism. One thinks, of course, of Pierre Joris’s tireless work against “mother tongue” hegemony, his elaboration of a “noetics,” and his current project translating (and anthologizing) Berber and other poets of the Maghreb. (Check out this fantastic interview.) But also of poets whose work is “camped out” at the site of various institutions and discourses, operating an open-ended institutional critique. Lisa Robertson’s investigations of the gendered vectors of the pastoral (XEclogues), and of “talk about the weather” (The Weather). Jill Magi’s forthcoming book, Cadastral Map, interrogating the pastoral boosterism behind American real-estate, how it has become a habit of our vernacular. Yedda Morrison’s staging of the social constructedness of factory and agricultural labor (Crop). (Reviewed here by Linda Russo.) Ian Demsky’s massive documentary poem on the Deep Horizon oil spill (excerpt forthcoming in the Interim Magazine ecopoetics feature). Or poetry that moves out of the self-contained “house” of the poem altogether, like Rodrigo Toscano’s “Collapsible Poetics” theater, exacerbating the spaces (excruciating, in the current political climate) between action and words. I think of Aaron Vidaver’s book-length documentation of a confrontation between residents of the Woodwards Squat and Vancouver police, Woodsquat (published as an issue of West Coast Line, 37/2-3), to be an epic work of poetics, an ecopoetics in its multi-faceted (and multi-voiced) attention to the fraught vectors of dwelling in a globalized, neoliberal police state.